The Muslim Prison Board (KwaZulu-Natal) was established more than 30 years ago in 1981. The Board was established out of concern and interest for our incarcerated Muslim brothers and sisters. 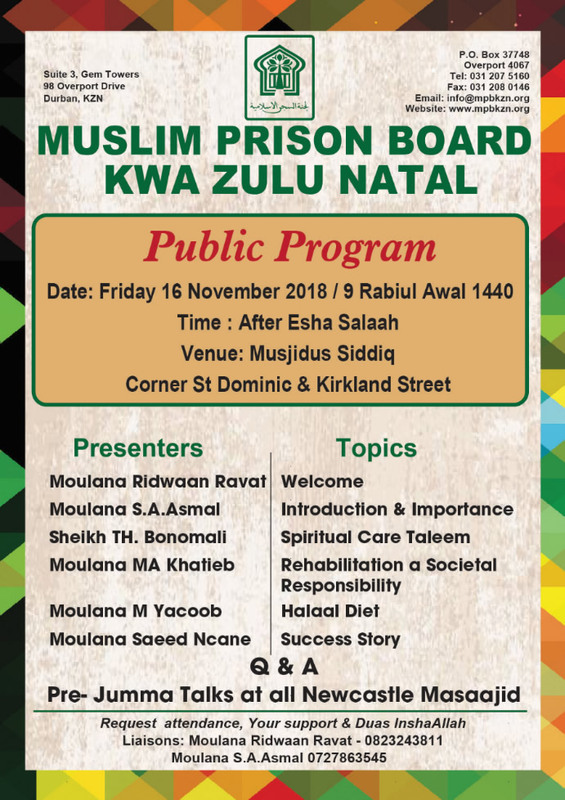 Initially launched by concerned individuals and organizations under the name Muslim Board for Prison Welfare and State Institutions Natal, it later became better known as the Muslim Prison Board (KZN). The MPB (KZN) is a constituted body serving the province of KwaZulu-Natal. The Board is well respected and recognised by the highest authorities and has built a good working relationship in many areas. The Board also has the support and respect of prominent Ulama and Organisations in the province. MPB (KZN) employs the services of authorised Spiritual Care Workers to promote Deen at the respective Correctional Centres on a voluntary basis. To inspire to make the incarceration of Muslim inmates as smooth as favorable as possible in the hope that they preserve their Imaan (faith) in the hostile prison environment and that they reform their lives in conformity with the Noble Quraan and Sunnah to become active contributing members of society.